In today’s buzzing society, many of us are inundated with things to do. Add to that the number of devices we need to have in order to keep up with it all. The last thing some people want is a gadget to remind us of how little time there is left to take care of our mile-long lists of Things-to-Do; and Heaven forbid we are running out of time! My goodness, that’s the last thing anyone wants to feel! Well, after sifting through a handful of Luminox 3181 reviews it took only minutes to surmise that this time-telling toy is quite a difficult one to pass up – and may even ease our time-related anxiety. Researching for a watch is not easy. My experience led to many dead ends. I was able to find lists of the watch’s specs, but when it came to reviews my findings were sparse. Purchasing the watch was somewhat of a leap of faith; but I possess supreme instinct when it comes to these kinds of investments and couldn’t be happier – and neither can my fiancé, for whom I bought the Luminox 3181. The 3181 belongs to Luminox’s steel colormark chronograph 3180 family. Every models from this collection features self-powered illumination through its exclusive LLT, ”always visible”, or Luminox technology which brings the device to a whole new level of functioning. How does it work? Well, itsy bitsy gas lights installed into the gadget’s hands and hour-markers (akin to those used by the US Army) do the trick, resulting in a timepiece that supersedes any of its kind. 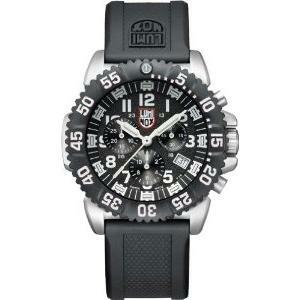 Anyone who straps this timepiece around their wrist will feel like a member of the Armed Forces in no time flat. The dial case measures 44m wide. 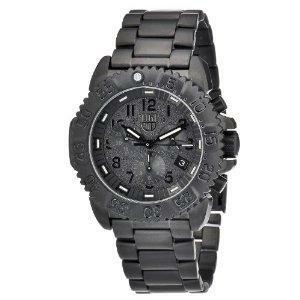 Its robust stainless steel construction is engraved on the back with the Navy Seal insignia. The case is embellished with a black carbon reinforced PC uni-directional rotating dive bezel and finished with an ultramarine-blue phosphorescent night vision tube. The light that you see illuminating from the watch is created via radio luminescence process. This means that no external energy is necessary and the watch’s dial gleams in the dimmest of light for 20 years. Holy engineering, Batman! It also displays white Arabic numerals every five minutes and is serrated for simple turning. Resilience and reliability are the key elements to this sturdy timepiece. So if you’re a lightweight, or prefer a watch that won’t constantly remind you that you are wearing one, look elsewhere! This is a serious piece of craftsmanship. Here’s where it gets a little muddled but I will try my best to describe the Luminox’s hands, markers, light color significance and time-telling details. It depends exactly on which model we are referring to. As for the 3181, the watch features white hour markers while the hour, minute and second hands radiate blue in the dark (however, the tip of the second hand gleams yellow and green just like the 12 o’clock dot). During the day all of the dial’s features are white. I have to confess, there is a bit too much going on when it comes to this watch. I did have to have my fiancé teach me how to tell time on it. So if you are more of a simpleton, once again the Luminox, especially this chronograph series is definitely not for you. As I come to understand however, minute indices and a circle provide dual hour time in Arabic numerals. Plus, there are 12-hour, 60- and 30-minute counters, and even a date window at the third hour which is sheathed in a scratch-resistant mineral cover for extra security. 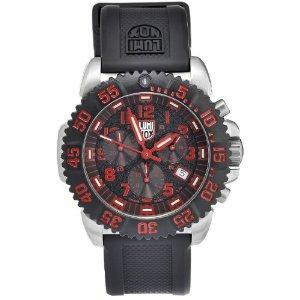 On that note, I discovered in a Luminox 3181 review that this intricately crafted timepiece was designed to survive the most threatening of perils imposed by impact and water. So revered in fact, the watch is trusted to be classified as military watches and worn by some of the world’s most elite forces such as the US Navy SEALS, US Air Force Stealth Pilots, SWAT teams, and Police and Rescue Teams across the globe. The 3180 Steel colormark chronograph family consists of 6 members. The basic (I refer to it as original) is the 3181 model which comes with white marker and black rubber strap. Next on the line is the 3182 which is nearly identical to the 3181 if not for the stainless steel bracelet. Then there is the 3183 which features blue instead of white marker. This is followed by the 3187 which is the clone of the original except for the white dial and black hand markers. If you are a fan of red, the 3195 model is made just for you. But if white is your favorite color, you may want to look at our comprehensive list of white G-Shock collections that proves to be delight among white lovers. The last member of the family is labelled 3182.BO which is typically reserved for the limited edition. 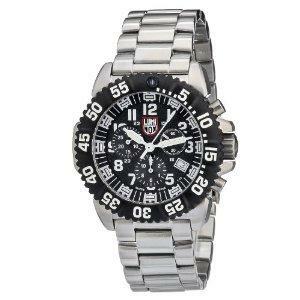 Being a chronograph series it is, the Luminox 3181 family is a one-step up from the basic Luminox 3050 colormark series. Now that you’ve seen our take on the Luminox 3180 steel colormark chronograph collection, we’ll leave it to you to decide if it is the tough watch that you’ve been looking for. Does it make the cut to be best buy at its price category? Find out in the battle for best tough watches under $500 class weight. 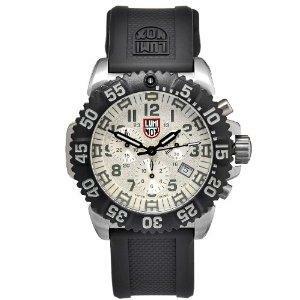 Luminox 3050 Colormark Series is Cheap. But is it Durable? 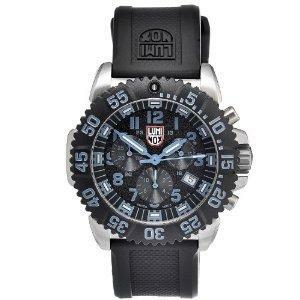 Luminox Sentry 0200 – Impressive Entry Level Tough Watch? What to Expect from the Luminox Original Navy SEAL 3000 Series? What Tough Watches are Fine Enough for Military Personnel?